On Monday, Rep. Luis Gutierrez (D-IL) suggested that until Congress passes sweeping amnesty legislation, “every institution in America” should find ways to ignore or work around federal immigration laws. He also said that President Barack Obama’s Deferred Action program was the first step in implementing more amnesty programs. He also pushed the Navy and Marines to allow U.S. citizens who are married to illegal immigrants to enlist at a hearing in which Durbin called on the Pentagon to start enlisting DREAMers. 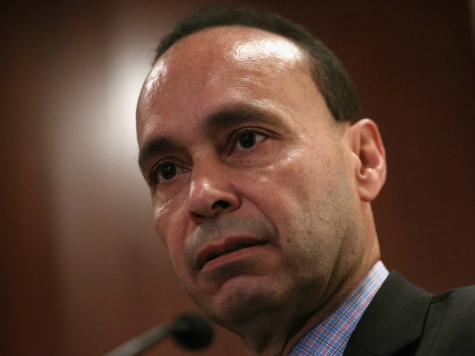 Gutierrez, one of the most vocal pro-amnesty legislators, has repeatedly called on Obama to flout the nation’s immigration laws even more and act unilaterally to give amnesty to more illegal immigrants, including the families of those offered temporary amnesty. Gutierrez and other pro-amnesty advocates pressured Obama’s Department of Homeland Security to undergo a review of its immigration policies. Last week, Homeland Secretary Jeh Johnson indicated to PBS’s Judy Woodruff that the administration may be on the verge of enacting executive actions to ease even more deportations, even though the myth that Obama is the so-called “deporter-in-chief” has been thoroughly debunked.